Things just don’t feel orderly at the moment – my life isn’t out of control, but it’s tumbling like clothes in the dryer, in a good way. One of these days I’ll get to make order – fold the clothes, so to speak – but right now is not the time. 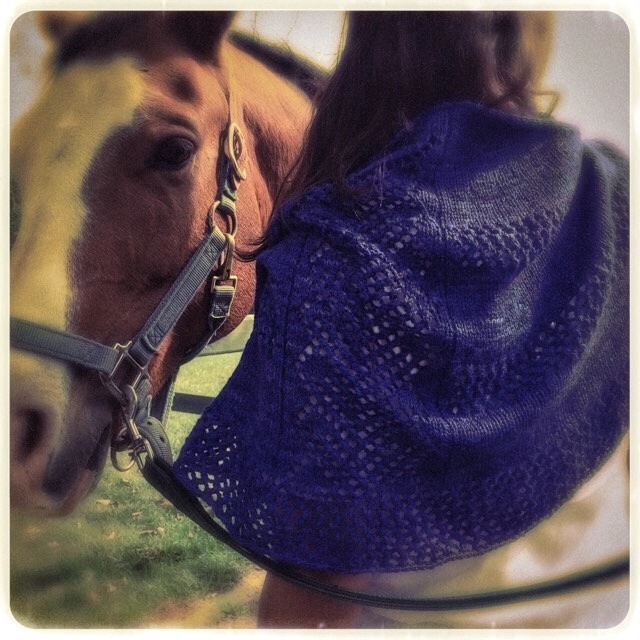 I’ve put the finishing touches on my new shawl pattern. It’s called Honey Locust, after the big old trees that shade my little office at Stony Hill. Though I didn’t get a chance to do a “real” photo shoot with one Remarkable R or the other, the photos I have manage to do the color and the lace some justice. I’m pleased and excited that the pattern will be a part of the Rhinebeck experience at Spirit Trail Fiberworks. When you purchase a skein of Brigantia to make Honey Locust, you’ll receive a coupon code for a free Ravelry download of the pattern! Visit Jen’s booth in Building A early and often, because I hear that she’s debuting lots of new colorways, including this one, Purple Peacock. There’s a lot of energy left here after the designing and knitting. Honey Locust wasn’t a struggle, but a catalyst. I have ideas, little notes scribbled in my book, and things I’d like to try. I want unspoken-for time, and a clear mind, and able fingers. I have all but the first thing. 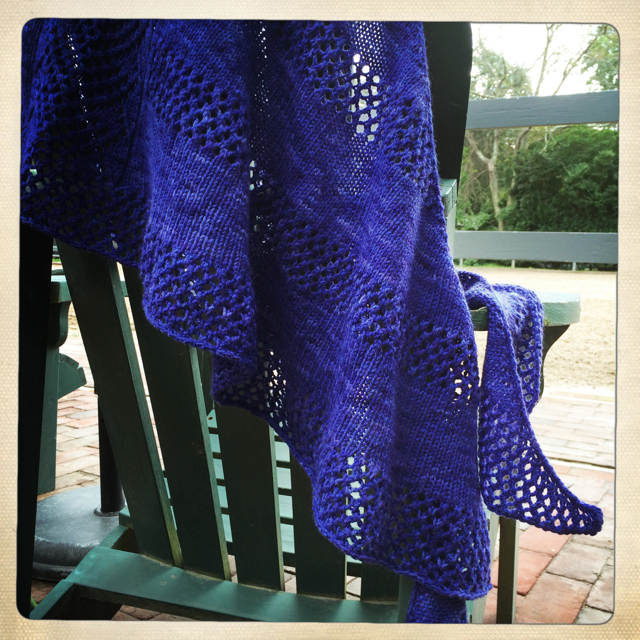 Honey Locust is knitted from the top down, with increases that create a gently-curved, wide crescent shawl. The lace panel is set into alternating bands of simple stockinette and Trellis Lace. It’s not complicated to work, and you’ll find a comfortable rhythm in the knitting. Instructions are written, and a chart is included for the Honey Locust Lace Panel. The Chinese Waitress cast-on is new to me, and it’s perfect for this shawl, so I’ve included links to two instructional videos. Please be brave and try it! The pattern will be available in my Ravelry Store beginning on Saturday, October 18 . It’s listed there now, so go on over and take a look!